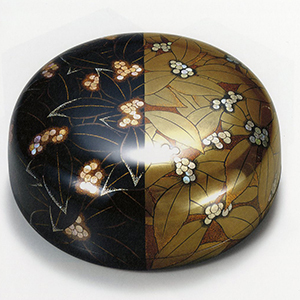 Murose Kazumi is one of the most esteemed urushi artists currently practicing in Japan. 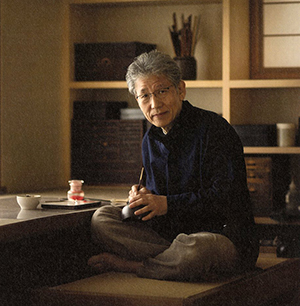 Known for his splendid maki-e technique, his commitment to the preservation and promotion of traditional kōgei (craft) has been his lifework. His achievements have also been recognized by the Japanese government, which in 2008 designated Murose as a holder of intangible cultural property or, colloquially termed, as a ‘Living National Treasure’. Urushi is one of the oldest media found in East Asia. Urushi oozes out from the scored urushi tree as a creamy, pale brown sap with a distinct musky smell. It is a precious medium as a single urushi tree (toxicodendron vernicifluum), indigenous to monsoon-affected regions, can only produce a mere cup full of urushi a season at best. In its liquid form, it is a highly irritant substance. Urushi can cause minor to severe reaction including rash, swelling and high temperature. Once properly handled and hardened, however, urushi is completely safe. It is durable, hardwearing and 100% biodegradable. Urushi has wide applications too: it can function as an adhesive, surface paint, varnish, sealant and more. From lavishly decorating surfaces to mending precious pots with sprinkling of gold dust along the seam, urushi has played an important role in the development of material culture and appreciation in Japan. Murose’s works are appreciated for their bold, but gentle and human qualities. They are less sculptural and more functional. From a small incense case that fits neatly within the palm of one’s hand to lidded boxes, drawers, musical instruments and large decorative panels, he appreciates surfaces that are intended to be used through use and touch. The images he creates are often abstract responces to elements found in nature. Carefully considered and highly stylized in design, he captures the ephemeral beauty of the natural world through using a combination of urushi techniques. Images of plants and flowers in particular are among his favorites. He articulates his flora and foliage each with careful consideration, as though a master gardener who prunes his plants with trusted experience. His subtle use of gold maki-e –a technique involving sprinkling gold powder on wet urushi ground–resonates with the humble and amicable personality of the artist. Even in his more lavish works that involve dense use of gold, mother-of-pearl inlay and other precious materials, he is a master of sophisticated restraint. The techniques he employs are all faithful to traditional practices yet his compositions echo a graphic design approach. His work is strikingly modern yet deeply rooted in history. Such combination of stylized images with a graphic sensibility prompts new visual approaches to reading his work. His square box ‘Spring’ (2011) and circular container ‘Chloranthus’ (2000) are charming examples. In ‘Spring’ the single image of flowering foliage is split diagonally into two triangular halves. In one half, the camellia flowers appear red against the black maki-e tipped leaves. The other half shows the blossoms in luminous white using green turbo shell inlay. Murose explains that the two halves are viewed as a single image and represent yin and yang. Similarly, ‘Chloranthus’ explores his long fascination with light. That is, sunlight and moonlight. Here, one half of the cholranthus bouquet is bathed in day light while the other half shimmers under the cool ray of the moon. Whether by shifting colours, separating planes, or interjecting with geometric shapes or lines, his work often presents two separate elements that lock in as a one to form a single entity. The two halves seem to speak not about the whole, but about what makes the whole. Like yin and yang, day and night, and old and new, somewhere between two opposites is where he finds his comfort zone. This visual duality seen in some of his works resonates with Murose’s personal history. Born in 1950 as a son to an established and esteemed urushi artist, Murose Shunji, the young Murose became very aware from an early age of the need to bridge two worlds: a world steeped in tradition and another forced to adapt to modern Western influenced lifestyle. Murose learned urushi in earnest at the Tokyo University of the Arts. This was the only university at the time to offer courses in this art. His father also introduced him to one of the greatest urushi masters of modern times, Matsuda Gonroku, who Murose venerates to this day. Gonroku’s principle student, Taguchi Yoshikuni, was also Murose’s mentor. 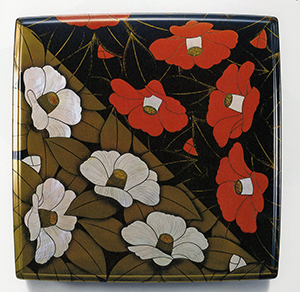 Under their tutelage, Murose learned as a craftsmen the rich history and techniques of urushi. As an artist, he followed the artistic spirit of Matsuda Gonroku and especially of Taguchi to refine and develop his own working styles. His work is deeply rooted in tradition while his designs explore new ways of translating the beauty of urushi that speak to the modern world. The Sainsbury Institute has had the privilege of working with Murose over a number of events and projects. One of the highlights was to invite the artist to hold a series of demonstrations in 2007 where he showed the audience for close inspection a beautiful rectangular music box. Tubes used to sprinkle gold powder were also displayed where many mimicked the maki-e technique. 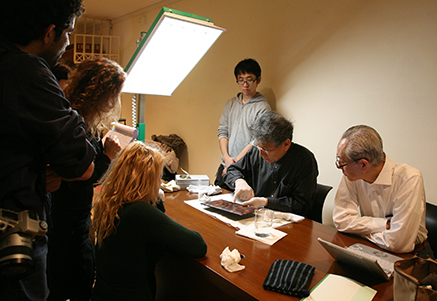 Our continued relationship with Murose, who has recently been appointed as Deputy Chairman of the Japanese Traditional Kōgei (craft) Association, has enabled the Institute to study and promote the importance, beauty and history of urushi. Recently, he gave a joint lecture at the International House in Tokyo with Nicole Coolidge Rousmaniere on “Japan’s living kōgei (craft) traditions”. From creating a dazzling world in miniature to a dynamic visual spectacle, his mastery of urushi has inspired many around the world. Together, we hope to explore further the boundary between traditional and contemporary, and to communicate the rich history and the importance of urushi and the traditional art of Japan.